The location of R'lyeh given by Lovecraft was 47°9′S 126°43′W﻿ / ﻿47.150°S 126.717°W﻿ / -47.150; -126.717 in the southern Pacific Ocean. August Derleth placed it at 49°51′S 128°34′W﻿ / ﻿49.850°S 128.567°W﻿ / -49.850; -128.567. Both locations are close to the Pacific pole of inaccessibility or "Nemo" point, 48°52.6′S 123°23.6′W﻿ / ﻿48.8767°S 123.3933°W﻿ / -48.8767; -123.3933, a point in the ocean farthest from any land mass. R'lyeh is a fictional lost city that first appeared in the H. P. Lovecraft short story "The Call of Cthulhu", first published in Weird Tales in June 1928. In the story, R'lyeh is a sunken city in the South Pacific and the prison of the entity called Cthulhu. The nightmare corpse-city of R'lyeh…was built in measureless eons behind history by the vast, loathsome shapes that seeped down from the dark stars. There lay great Cthulhu and his hordes, hidden in green slimy vaults. R'lyeh is characterized by bizarre architecture likened to non-Euclidean geometry. Norwegian sailor Gustaf Johansen, the narrator of one of the tales in the short story, describes the accidental discovery of the city: "a coast-line of mingled mud, ooze, and weedy Cyclopean masonry which can be nothing less than the tangible substance of earth's supreme terror—the nightmare corpse-city of R'lyeh...loathsomely redolent of spheres and dimensions apart from ours". The short story also asserts the premise that while currently trapped in R'lyeh, Cthulhu will eventually return, with worshipers often repeating the phrase Ph'nglui mglw'nafh Cthulhu R'lyeh wgah'nagl fhtagn: "In his house at R'lyeh, dead Cthulhu waits dreaming". Lovecraft claims R'lyeh is located at 47°9′S 126°43′W﻿ / ﻿47.150°S 126.717°W﻿ / -47.150; -126.717﻿ (R'lyeh fictional location (Lovecraft))Coordinates: 47°9′S 126°43′W﻿ / ﻿47.150°S 126.717°W﻿ / -47.150; -126.717﻿ (R'lyeh fictional location (Lovecraft)) in the southern Pacific Ocean. 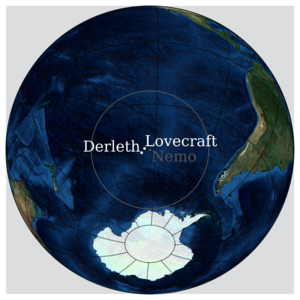 Writer August Derleth, a contemporary correspondent of Lovecraft, placed R'lyeh at 49°51′S 128°34′W﻿ / ﻿49.850°S 128.567°W﻿ / -49.850; -128.567﻿ (R'lyeh fictional location (Derleth)). The latter coordinates place the city approximately 5,100 nautical miles (9,400 km) from the actual island of Pohnpei (Ponape), the location of the fictional "Ponape Scripture". Both locations are close to the Pacific pole of inaccessibility (48°52.6′S 123°23.6′W﻿ / ﻿48.8767°S 123.3933°W﻿ / -48.8767; -123.3933﻿ (Oceanic Pole of Inaccessibility)), the point in the ocean farthest from any land mass. The Tsuburaya Productions tokusatsu series Ultraman Tiga (1996-1997) places R'lyeh in the South Pacific and about 200m away from point Nemo the furthest place away from land, and the series' antagonist, Gatanozoa, was born there. The name Gatanozoa is an alternate version of Ghatanothoa, a monster that appears in Lovecraft and who was identified by Lin Carter as a son of Cthulhu. Charles Stross' novella A Colder War (2000) locates R'lyeh in the Baltic Sea, describing Cthulhu as being "scraped from a nest in the drowned wreckage of a city on the Baltic floor". In Brian Lumley's Primal Land short story "The House of Cthulhu" (2007), the island is referred to as "Arlyeh". ^ Lumley, B. (2007). "The House of Cthulhu". The House of Cthulhu: Tales of the Primal Land, Volume 1 (1st trade pbk. ed.). New York: Tor. p. 87. ISBN 978-0-7653-1074-3. Derleth, August (2000) . "The Black Island". Quest for Cthulhu. New York: Carroll & Graf. ISBN 0-7867-0752-6. Harms, Daniel (1998). "R'lyeh". The Encyclopedia Cthulhiana (2nd ed.). Oakland, CA: Chaosium. p. 255. ISBN 1-56882-119-0. Lovecraft, Howard P. (1984) . "The Call of Cthulhu". In S. T. Joshi (ed.). The Dunwich Horror and Others (9th corrected printing ed.). Sauk City, WI: Arkham House. ISBN 0-87054-037-8. CS1 maint: Extra text: editors list (link) Definitive version. Pearsall, Anthony B. (2005). The Lovecraft Lexicon (1st ed.). Tempe, AZ: New Falcon. ISBN 1-56184-129-3.